WSJ Society membership continues to grow. The number of members registered at WSJSociety.com has increased to 147, over 27% of active members. And, we had 3 of our former colleagues participate in the Fall Luncheon as guests. All signs of increased interest in the WSJ Society, or at least curiosity about what’s going on. Let’s keep it rolling. I’ve had several questions at the Help desk regarding sending a private message. To do that you first need to make a connection with the person you want to engage. That starts with finding their name in the Member list of those who have registered on WSJSociety.com. Here’s how you can do that. Login and select the WSJ Society link. Then, on the WSJ Society page, select View Members. You will see the list of all members who have registered on the site. Browse the list or search to find the person you are after. If they have registered, you can initiate the process to make a connection by clicking on the Connect with user link below their name. They will receive an email regarding your request and a link to either accept or reject your request. Remember we all control our individual exposure – that’s a good thing. Everyone should be comfortable with their activities here on our website. Try it out. For more information on using WSJSociety.com go to The User Group. It has a link posted in its description that will allow you to view and download the User Guide. While you are on the Groups page, scan down the page and look at the Groups that have been set up. There is a statement of the purpose of the group at the top of their page for your consideration. These are all Public Groups. That means you can click on the name to view the activity of the Group, enter your thoughts in the What’s new . . . box, or, add a comment to any entry by clicking on the Comment(s) link below each entry. You don’t have to be a member of the Group. 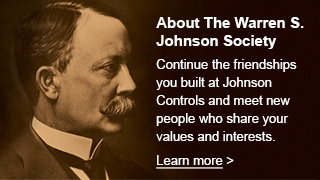 When I described WSJSociety.com to a friend as a way to connect with former colleagues and share interests with new acquaintances, his first remark was ‘Why would I want to do that?” I’ve thought about that repeatedly as we’ve introduced the website. My best response so far is: “Because we are all better together.” Together at WSJSociety.com we can enjoy and support each other and find new ways to contribute to our communities. With that thought, you will see that I selected a logo for each of the Groups from those used by Johnson Controls and companies that are part of the Johnson Controls we know today. Together they – we created something special – better together. What do you think? Let us all know by putting your thoughts in the Open Forum Group, a great place to have a discussion like this.